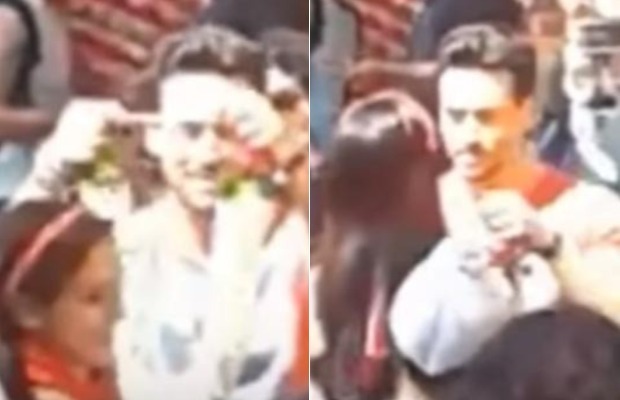 Watch: Baaghi 2 Star Tiger Shroff Secretly Marries Disha Patani In Goa? Video Leaked! Tiger Shroff and Disha Patani are going to be seen together in the film Baaghi 2! The Bollywood couple Tiger Shroff and Disha Patani had set the internet on fire with their vacation pictures from Sri Lanka. The lovely couple welcomed the New Year together in the foreign country. They were proved a hit jodi when their single Befikra was released. The Baaghi 2 stars are again making headlines, but this time for a different reason. A video of the two of them has gone viral on social media, which sees the actor marrying the actress by putting a Jaimala around her neck. But before you think anything else, let us tell you all that it was from the sets of Baaghi 2. So, yes the couple has not actually got married! The video also shows the jaw-dropping action sequences that the actor will be seen performing in the film. Tiger is currently shooting for the film Baaghi 2. He was also the lead in the first part of the film along with Shraddha Kapoor. But in the sequel, the actor’s girlfriend Disha Patani has replaced the actress. Helmed by Ahmed Khan, the film is being produced by Sajid Nadiadwala. It is all set to hit the theatres on March 30, this year. Both Tiger and Disha took to Twitter today sharing the poster of the film, which reveals its release date as well. Talking about the professional front of the actor, Tiger Shroff is also a part of Yash Raj Films’ next venture. The film also stars Tiger’s idle, Hrithik Roshan. He will also be seen in Karan Johar’s Student Of The Year 2. The film also stars the B-town actor Chunky Pandey’s daughter Ananya Pandey, who will be making her Bollywood debut with this film. Previous articleThis Hilarious Video Hints Kapil Sharma Prepping Up For The New Season Of The Kapil Sharma Show? Next articlePhotos: Virat Kohli – Anushka Sharma Are Having A Funtime Exploring Cape Town With Shikhar Dhawan And Family!